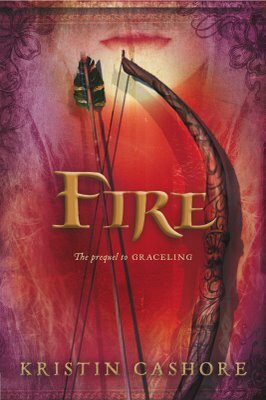 Fire is the prequel (but totally stand-alone story) to Kristin Cashore's Graceling. It centers on Fire, who is a monster where she is from. She is absolutely beautiful, has spectacularly red hair and has the power to make people want her, even against their will, and to use that power for her purposes. Her father was also a monster, and used his power for such terrible reasons that the kingdom of the Dells is on the verge of civil war. Fire does not wish to abuse her powers, so she tries to hide her beauty and stay away from others. But when the king comes asking her for help to save their country, she must decide whether to use her power for good. I wasn't overly impressed with Graceling when I read it early this year. I enjoyed it, but I didn't love it the way I expected I would. But as I am determined to get through all the fantasy series I'm in the middle of before starting any new ones, I wanted to read this and move on. And I much preferred Fire to Graceling, perhaps because I haven't heard as much about it. I think Fire is a more sophisticated story. There is more going on- politically, emotionally, and morally. The decision Fire must make about how to use her power and wield it for good is one many people must make. It's hard to know when a gray area has been crossed into, and whether it's okay to step into the gray area if "the ends justify the means." I find this particularly relevant when you consider how many people recently (and throughout history) have started out hoping to make the world better and then ended up corrupted by their power. For me, Fire's internal conflict was very real and, like her, I am conflicted about whether I think she was right to use her power to help her country. I appreciated that Fire wasn't the only one grappling with these decisions. In a nation on the brink of war, everyone had to make them. The king. The military commander. The spy network. The landowners. A handsome man who enjoyed bed-hopping a bit too much. I like that Cashore showed each character facing his dilemmas and dealing with the consequences of his choices. I found this book engaging, though I think Fire became a bit melodramatic towards the end, saying things like, "I don't want to love you if you're going to die." Um... for obvious reasons, this is a flawed argument. Other than that, though, I enjoyed this book and I don't think you have to read Graceling first to understand it. Recommended for fans of young adult fantasy. I can't quite put my finger on why, but I enjoyed Fire tons more than Graceling - and I thought Graceling was fun! Not the best book ever, but enjoyable enough. Fire, on the other hand, kept me riveted. This one actually sounds more compelling to me than Graceling does. I bought Graceling to share with my daughter, but she was slightly put off by it and told me that she ended up skimming quite a bit of it. I am not sure when I will read it, but even if I don't get to it for awhile, I really want to read this one. I am glad that you liked it a bit better than the first in this series. Great review!! I was kind of blah about Graceling, but like you, I enjoyed Fire much more. Great review! Blodeuedd- I won't tell you what to do, really, but even if you don't LOVE Fire, I think you'd like it way more than Graceling. Angela- Exactly! I don't know why, either. I just thought it was a more sophisticated story. Zibilee- Yes, I think in the same way- Fire is similarly perfect to Katsa- some of the story is frustrating, but it is more engaging with the complications and morals, I feel. I really enjoyed reading Graceling so I'm really looking forward to this. Glad to hear you liked it even more than Graceling! It's admirable that you are trying to finish all the series books you've been reading. I wish I could too... but I've started so many series that are seriously long. And I've still got to re-read Abercrombie's novel. Interesting. Most people I know have thought Graceling was superior, but I have to admit I trust your judgement more (they aren't book bloggers, and they tend to read a lot I would never read). They also agreed that the end got melodramatic, though. Apparently that's universal. I still haven't decided if I should read this series. You've inspired me to make a list of the series that I haven't finished yet because I admire your rule. It feels a bit disrespectful to just have dipped my toe in a series and pronounced the water lovely and then wandered off to another pool. ::snicker:: And now I need to make a reading schedule, which looks like it'll stretch to 2027 to finish them all off. Fantasy is actually one of the genres that I have read the least of so getting a good recommendation for one to try is welcome. I actually had Graceling on my list but maybe Fire would be a better choice. I might still read Graceling first as I own that one. Though I may now have to purchase Fire! chasingbawa- Yes, I still hope you read Abercrombie! I'd love to hear your renewed thoughts. Amanda- I definitely thought Fire was (dare I say far?) superior to Graceling. But yes, melodramatic. I don't know if you'd really LOVE this series, but you might enjoy it. Kathleen- I think a lot of people like Graceling, too. For me, though, there was just way too much hype beforehand. Vivienne- Having a book makes me more likely to read it, too! This does sound good. I'd always thought I'd want to read Graceling before reading Fire, but after reading your review, I think I'll go straight for this one. Something about these books just doesn't appeal to me - I can't put my finger on what it is. But if I do decide to give this author a try after all, I'll remember to read Fire, not Graceling. Well darn, I can feel my vow to not read any more Cashore withering. It's interesting how Graceling gets more press, though...I think this is the first review of Fire that I've seen. Most people seem to prefer Graceling, but I think your reasons are good ones. Both are on my Someday list. I'll let you know what I think! I borrowed this from the library ages ago, but had to return it unread. I should rerequest it again and see where I set in the Fire v Graceling equation.